Posh v Sunderland on Easter Monday is an all-ticket game. 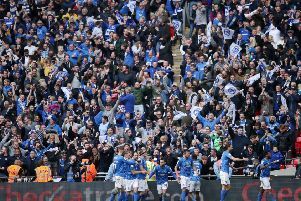 The visit of automatic promotion challengers Sunderland to the ABAX Stadium on Easter Monday (April 22, 3pm kick-off) has been made an all-ticket match for both sets of fans. Sunderland supporters have been allocated the entire Motorpoint Stand and part of the North Stand. The visitors are expected to sell out their allocation of 4,000 tickets. Tickets are on sale now from www.theposhtickets.com, via the Ticketmaster hotline 0844 847 1934 (calls cost 7ppm plus your network access fee) and in person at the ABAX Stadium Box Office.